I was invited to be a member of the artist panel for the discussion “A Light Touch: Crafting Comedy in Automata”, part of the fabulous event AUTOMATACON 2018. The discussion will take place on Day 2 of Automatacon, Saturday May 19 from 11:30am – 12:30pm at the Morris Museum, Morristown, New Jersey. 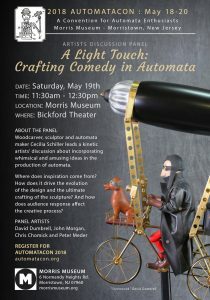 Come join me along with automata artists Cecilia Schiller, John Morgan, Chris Chomick and Peter Meder as we share thoughts about incorporating whimsical and amusing ideas in the production of our automata. For more information on Automatacon 2018, click here.